Top ‘Yesgrets’ include turning down dream jobs, holidays and even marriage proposals! 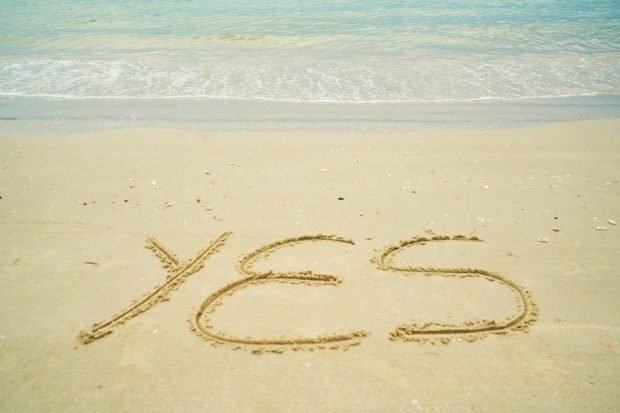 With many of us already either having broken, given up, or changed our minds about our 2018 New Year resolutions, new research commissioned by Jet2holidays suggests that instead of giving something up, the nation should be looking at how they can positively impact their lives by saying YES! The average Briton says ‘yes’ just nine times a day, but the research shows that four in ten of us (40%) are holding back and wishing we could say yes more often. The top reasons for saying no are not having enough money (41%), being tired (39%) and being too busy (35%). Nearly a quarter of the UK say no because they are too afraid to take a risk (22%). The research by the leading package holiday specialist shows how this is leaving the majority (75%) of us with ‘Yesgrets’ of one sort or another – a regret of not saying yes. The top Yesgrets are turning down a date (10%), saying no to a job, not booking a holiday (both 8%), as well as nearly one in 20 of us regretting not saying yes to a wedding proposal! In addition, rather than saying yes to things we love, as a nation we feel pressured into saying yes to things we actually do not want to do. Over a quarter of us (27%) admit to taking on extra work, 23% will order a takeaway despite being on a diet, and 12% will fall for the charms of a sales call despite not wanting to buy anything. Despite this, over half (53%) describe themselves as spontaneous. The most spontaneous location in the country is Swansea (70%) followed by Glasgow and Wolverhampton (63%) and Coventry (59%). The least most spontaneous place is Portsmouth (40%) followed by Oxford (43%) and York (44%). The research shows that we start off life being spontaneous (57% aged 18-24 and 55% aged 25-34) and end being spontaneous too (53% aged 55+) but somewhere in-between we lose it, with just 44% of those aged 45-54 and 51% of 35-44 year olds feeling spontaneous. It also reveals how we find our spontaneous side when on holiday, with 62% saying they find that side of themselves when they are away. Something about the sunshine and sea-air helps us to lose our stiff-upper-lip, with 71% trying new and exciting food, 40% partying until 6am, and 27% trying a new adventure sport (27%). Zoe Towers, Head of Product at Jet2holidays added: “This is the time of year when the nation decides what they want to change, and a number of people will decide to restrict themselves in some way rather then decide to be open to the possibility of saying yes. Our research demonstrates that the UK has many ‘Yesgrets’ and Jet2holidays wants to encourage the UK to change this! For further information or to book a great value package holiday, please visit www.jet2holidays.com. For flight only please visit www.jet2.com. One bedroom villa at Las Brisas, Playa Blanca, Lanzarote.